Most commercial household products and cleaning agents like glass cleaner use harsh chemicals that harm the environment, not to mention your hands. 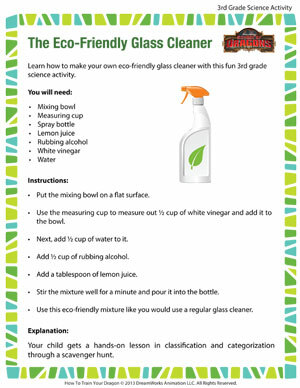 Why don’t you try this simple home glass cleaner recipe that uses easy to find, inexpensive ingredients? I’m sure your mom is gonna love it! And if you liked this free fun 3rd grade science activity, you must definitely give these 3rd grade science worksheets a shot!